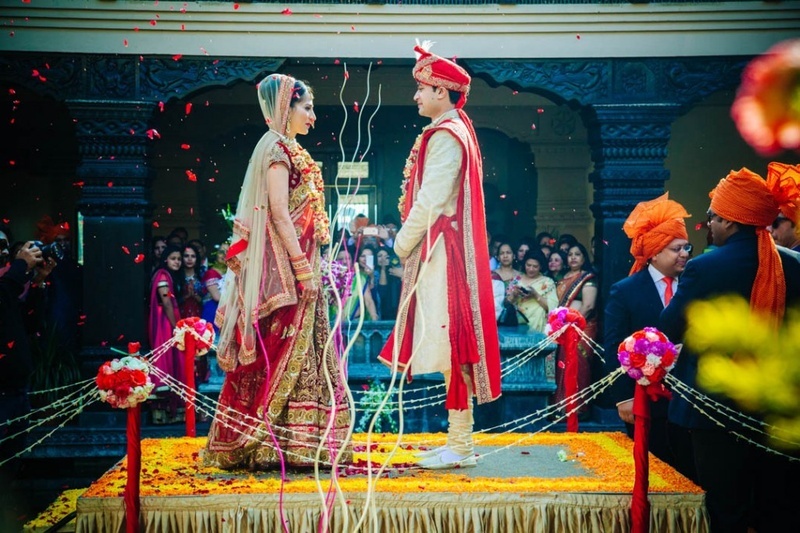 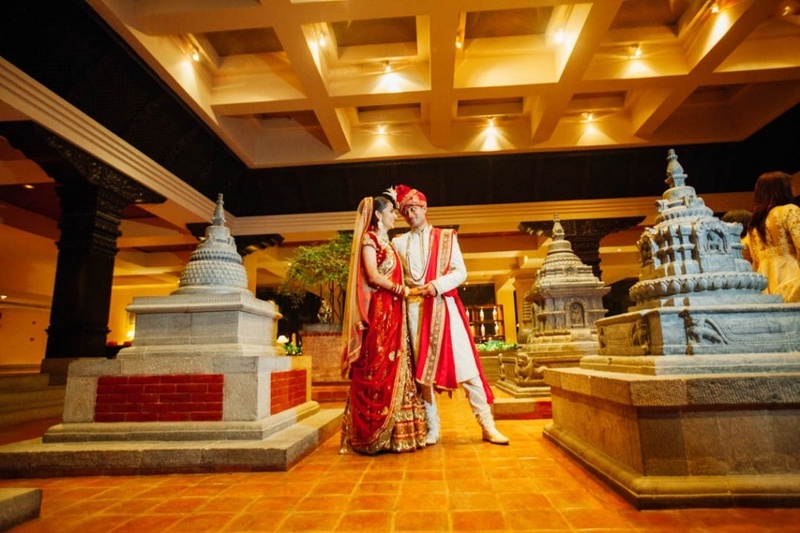 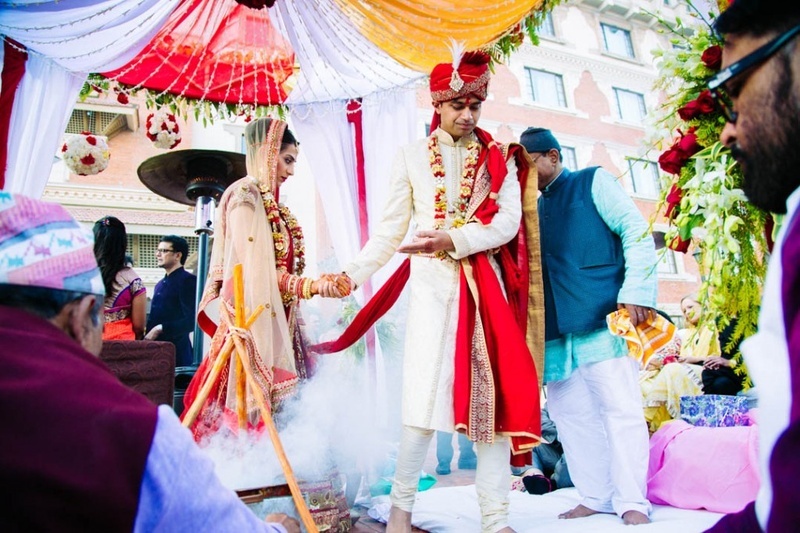 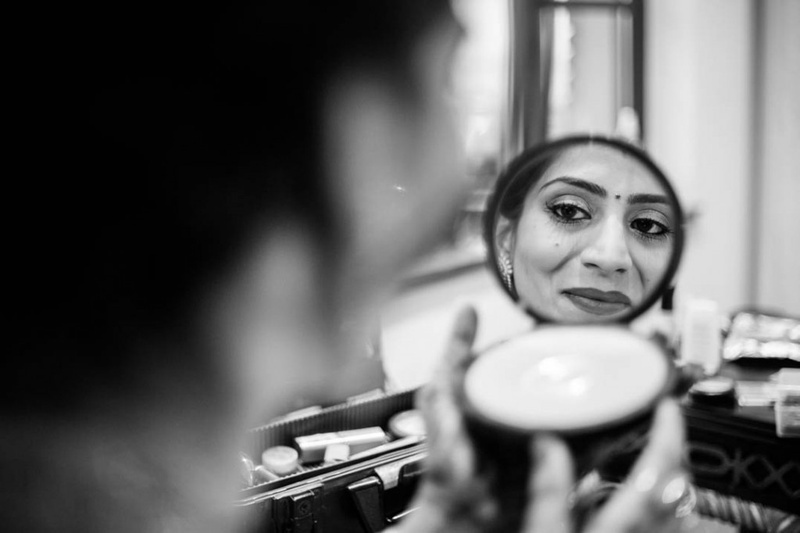 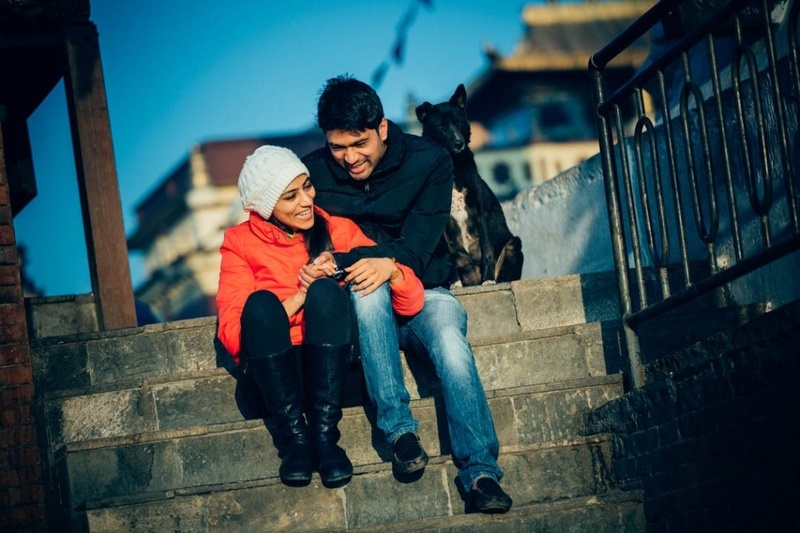 Mridula and Akhil are a Marwari couple who were born and brought up in Kathmandu, Nepal. 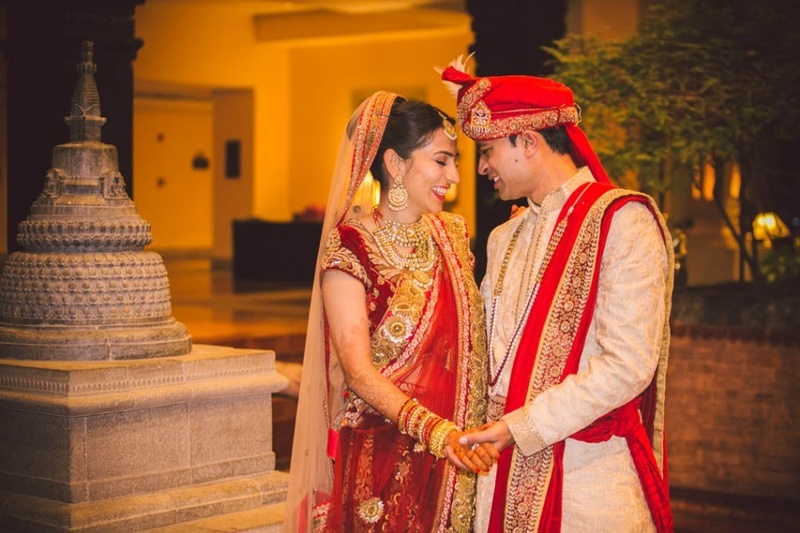 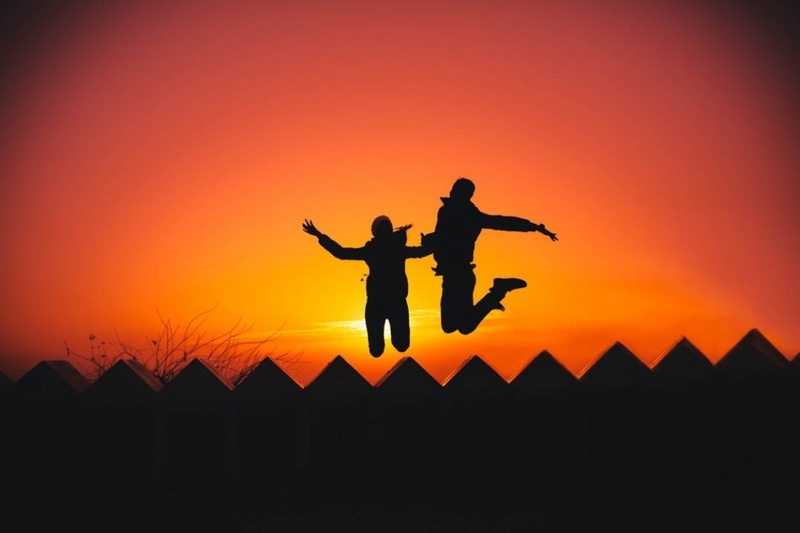 The two lovebirds didn’t take long to convert their casual meetings into a love affair and soon enough, they decided to tie the knot and plunge into a lifetime of togetherness. 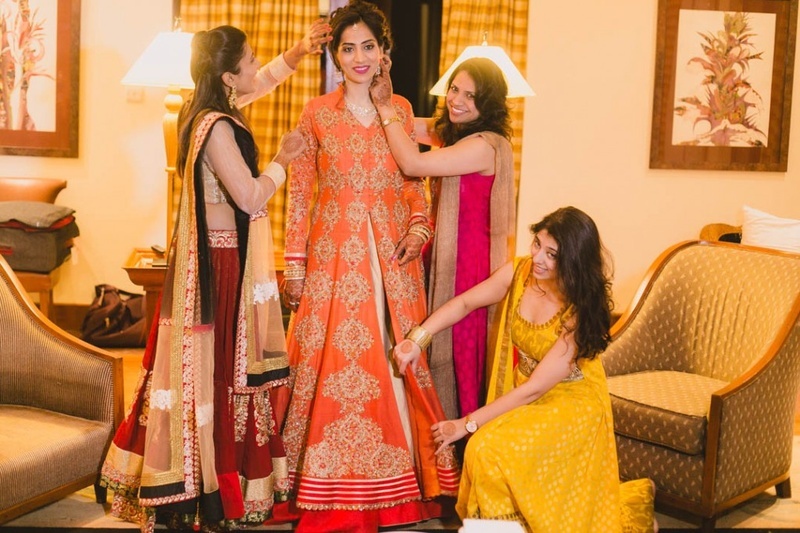 The wedding started off with the customary pre-wedding shoot that was relatively casual and laid-back. 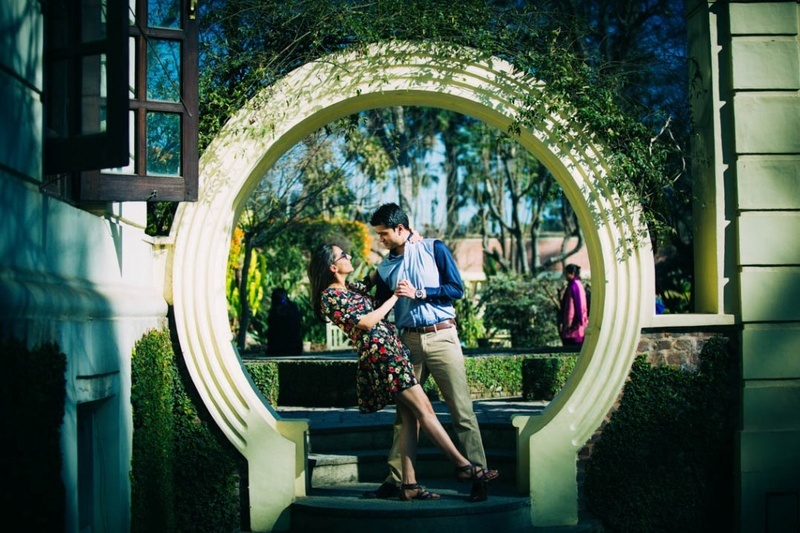 The couple were comfortable outfits and there was a relaxed vibe to the whole shoot. 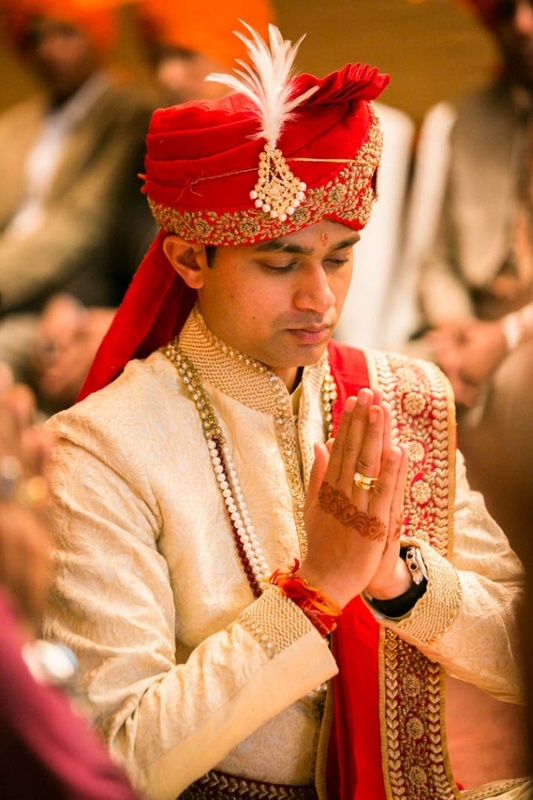 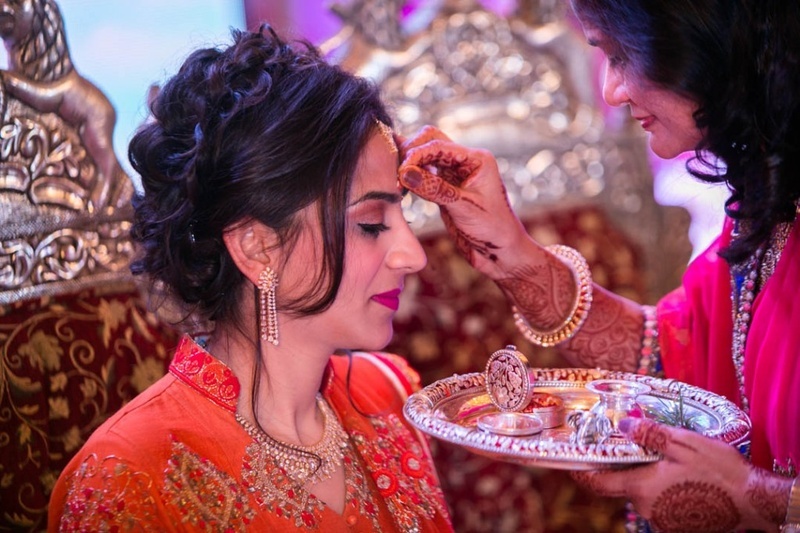 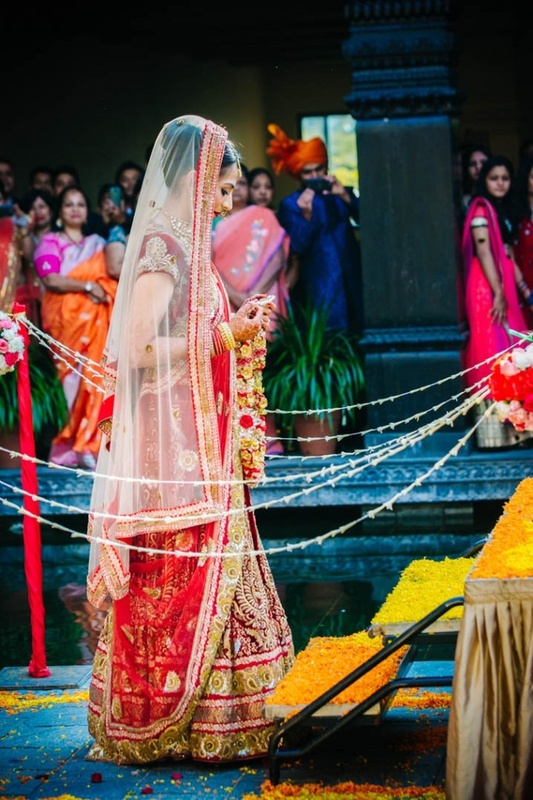 The Mehndi ceremony had our bride in an orange and cream lehenga with gold details. 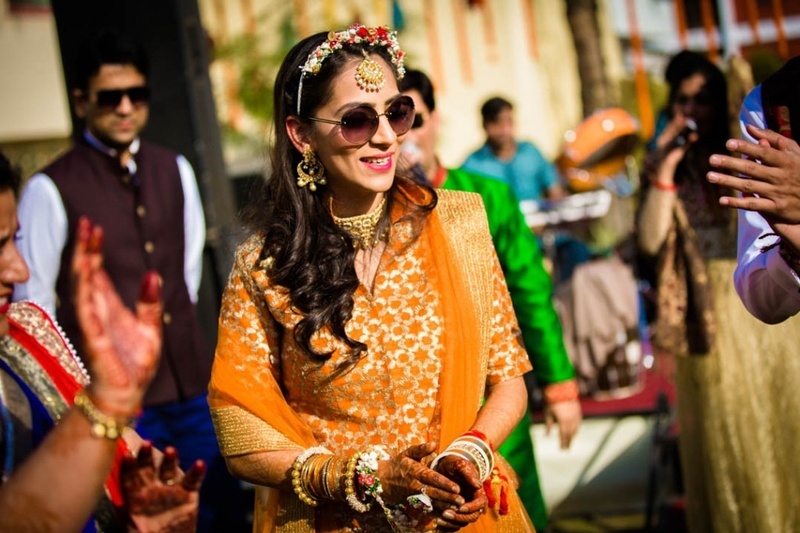 Her outfit matched the splendid marigold beautifully. 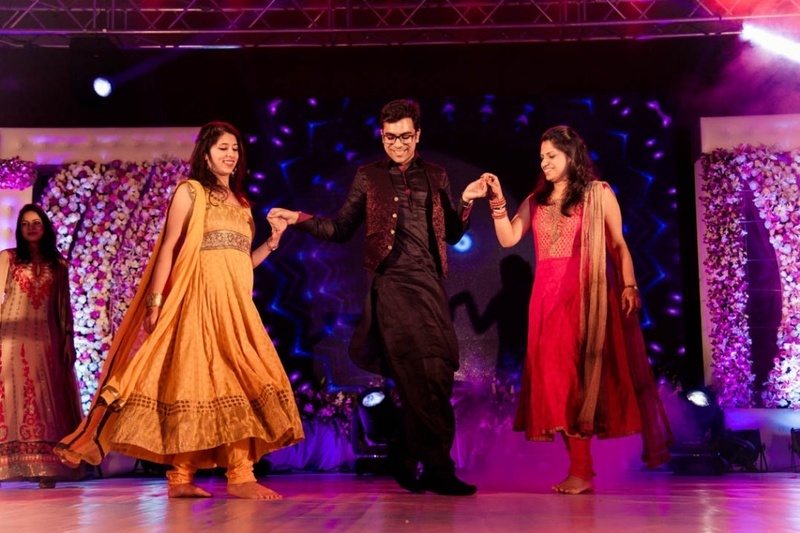 The groom looked no less dapper in a maroon bandhgala over a white shirt. 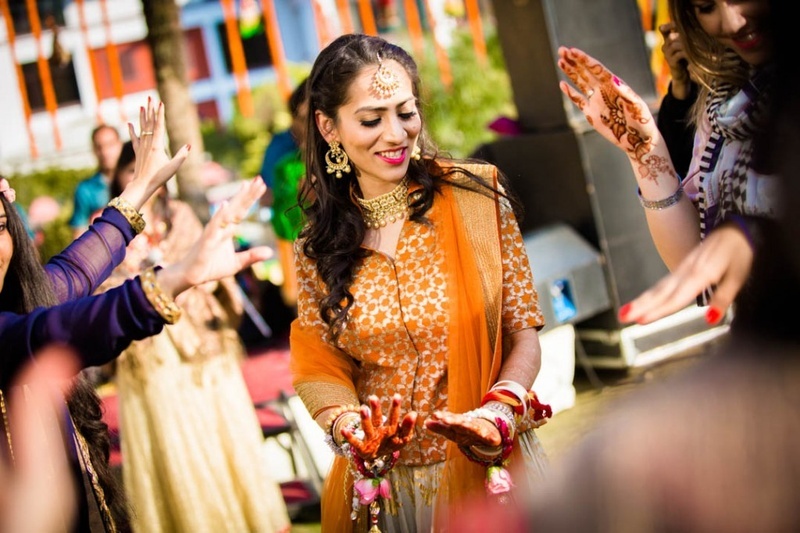 The Sangeet that followed had a completely different vibe compared to the casual nature of the Mehndi ceremony. 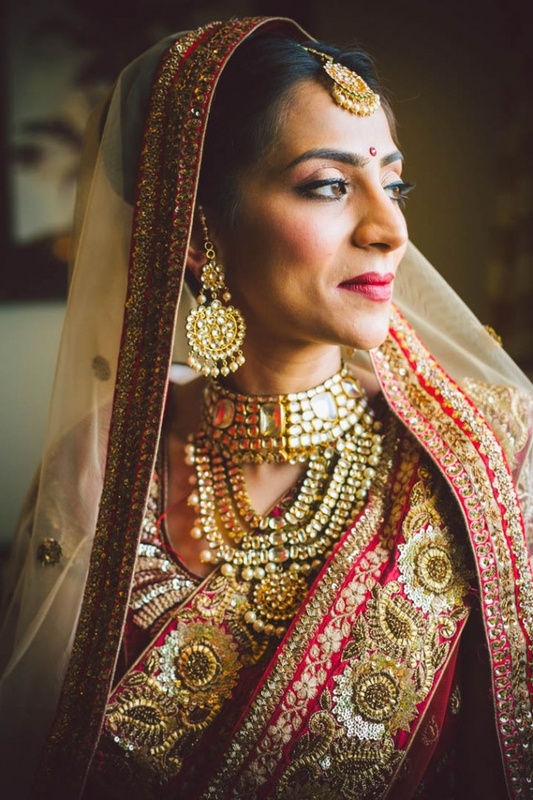 Once again, Mridula chose to don an orange jacket-lehenga which she accessorised to perfection with sparkling diamonds and subtly make-up. 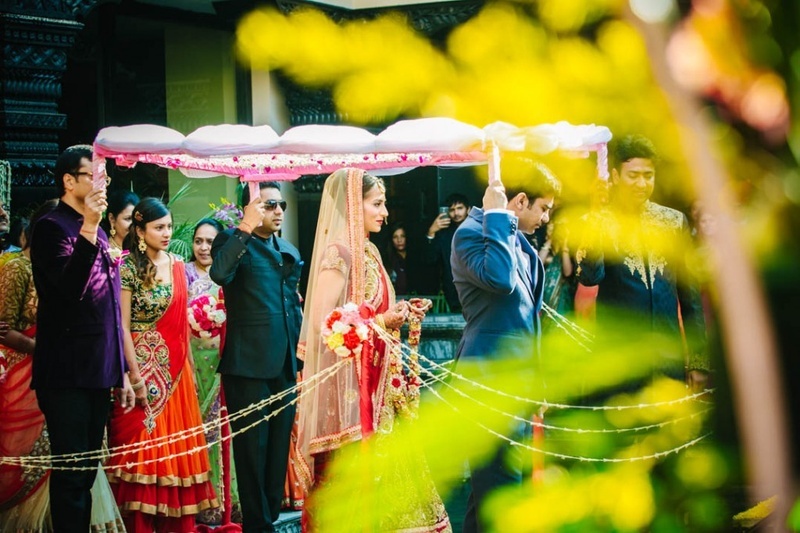 Our groom complimented her choice of attire with a deep blue ensemble with minimal gold details. 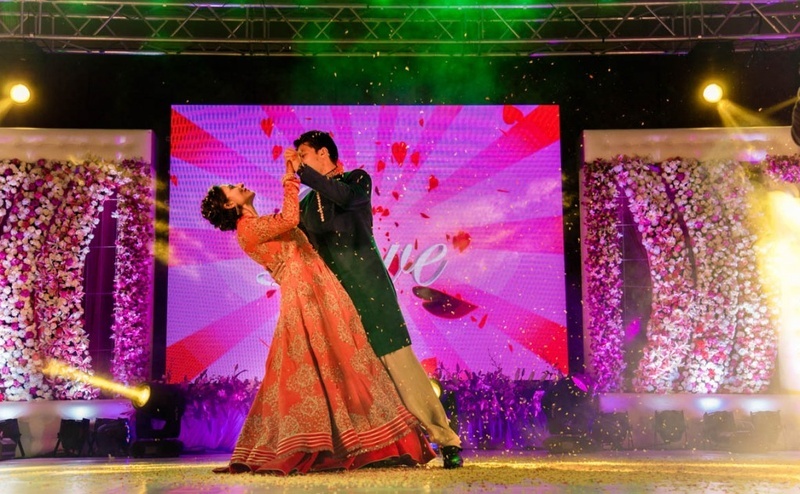 The entire night was spent dancing away to no end. 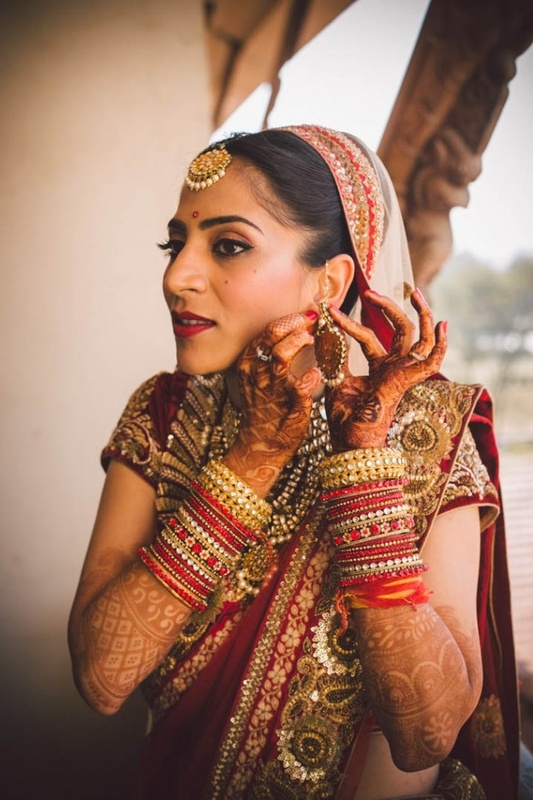 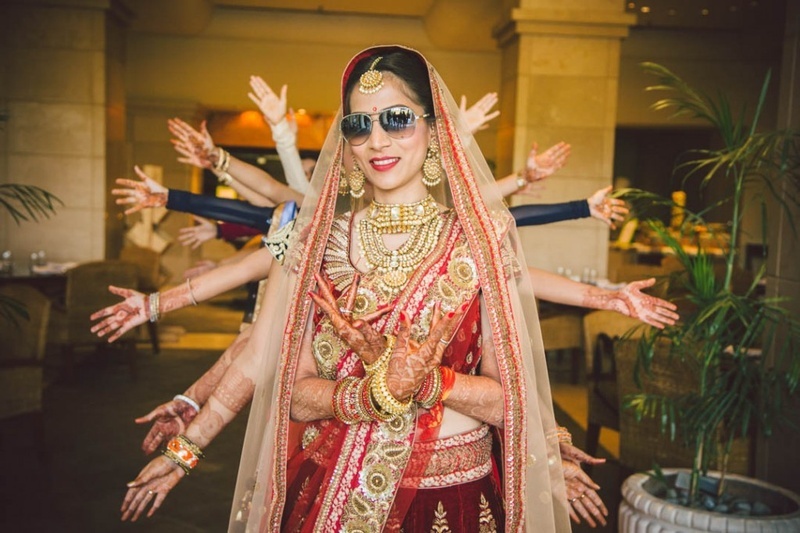 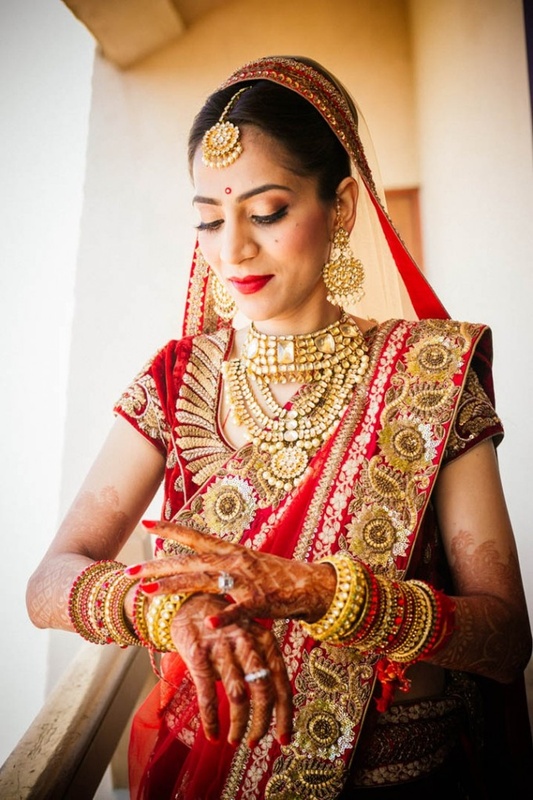 The wedding day dawned and the gorgeous bride-to-be graced the event in a classically traditional red lehenga with elaborate gold embroidery and jewellery to match. 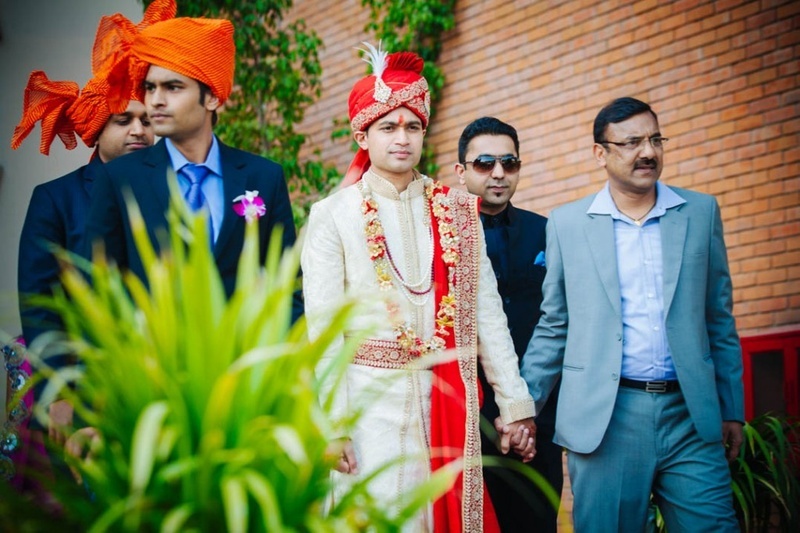 Akhil opted for a white and red ensemble that had a regal air about it. 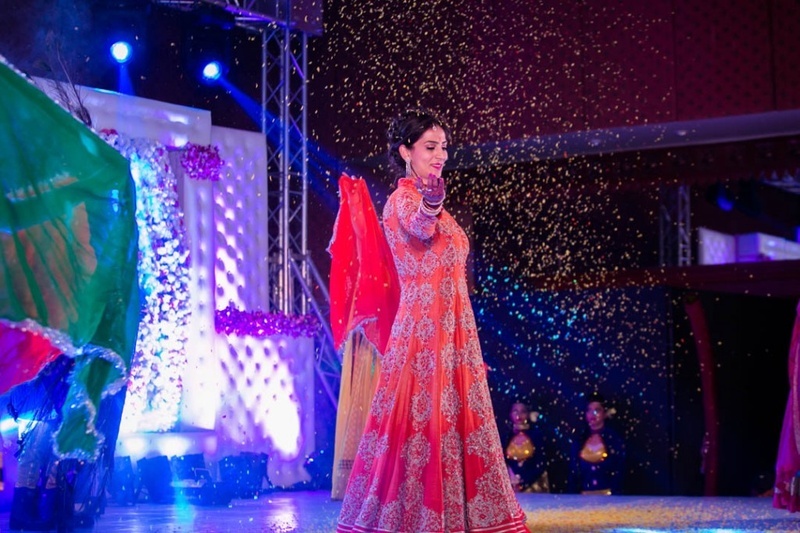 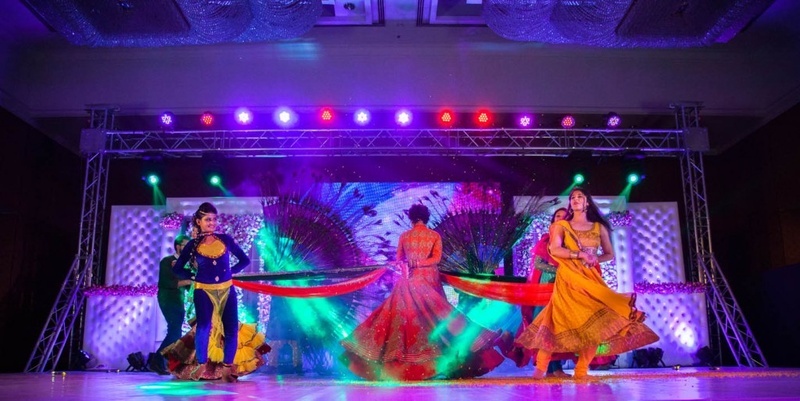 The entire event was a lavish affair at Hyatt Regency, Kathmandu. 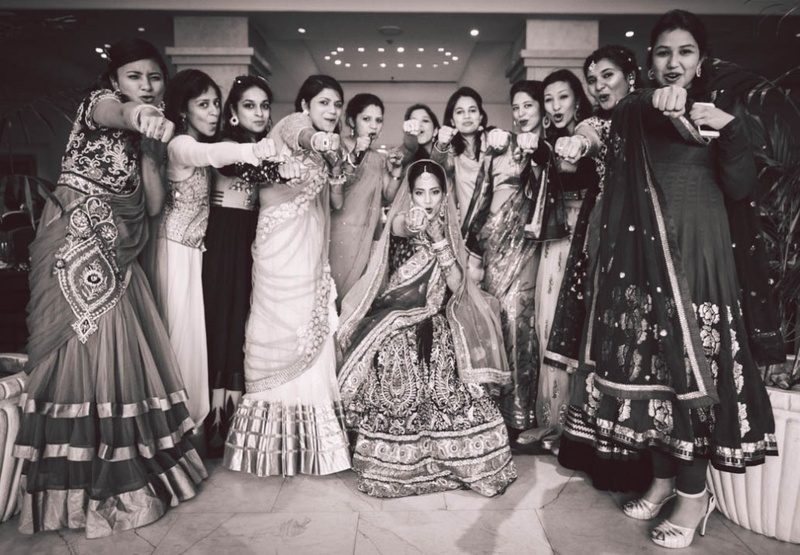 What we loved was that the bride’s girl-squad seemed to be just as happy as her, if not even happier! 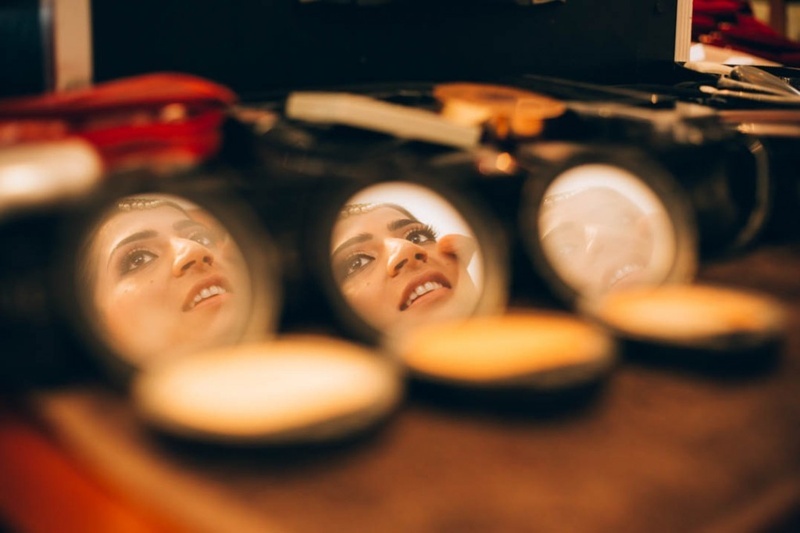 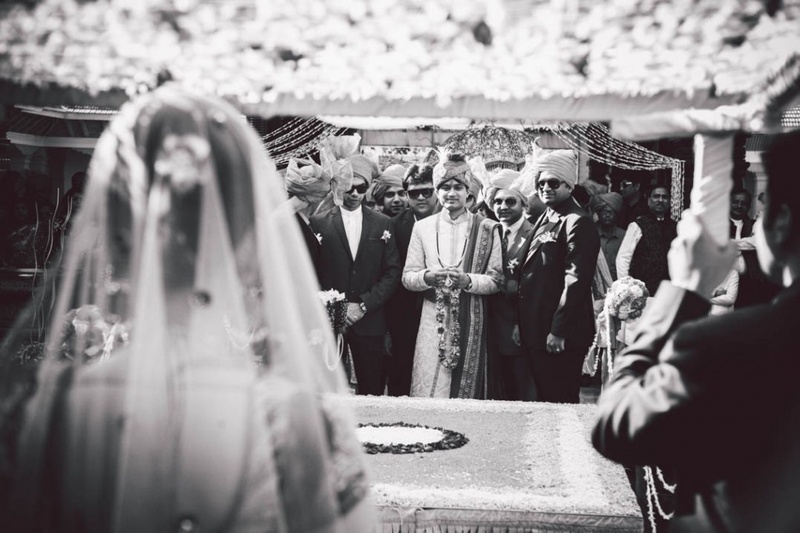 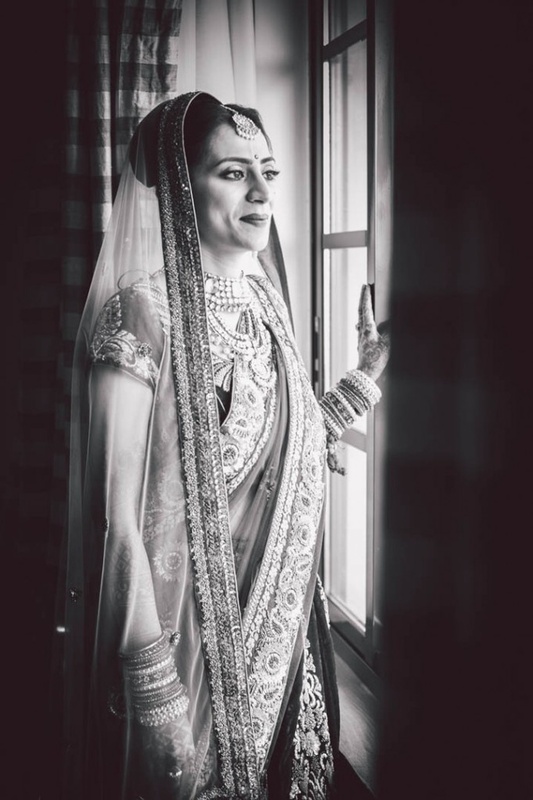 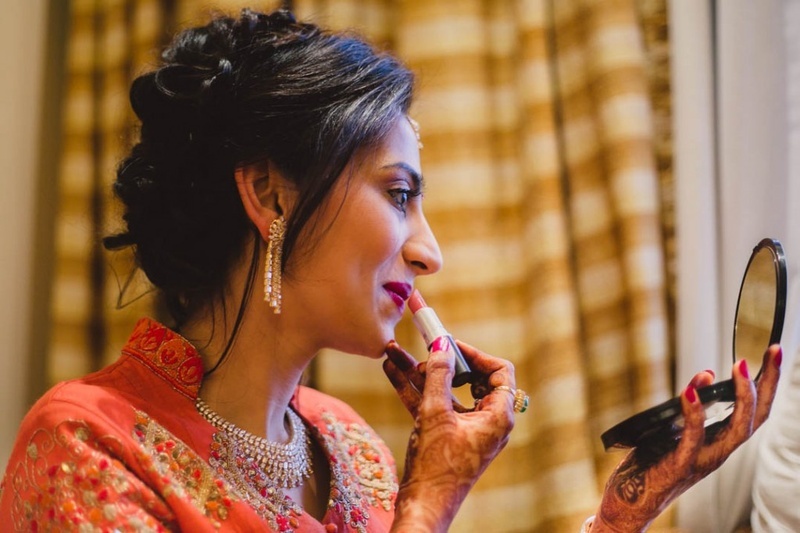 Look out for the amazing wedding moments captured beautifully by the team at Candid Shutters. 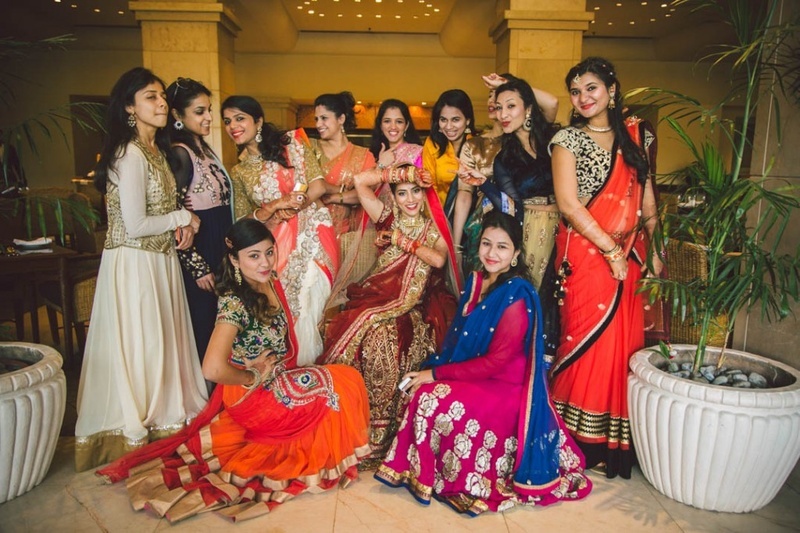 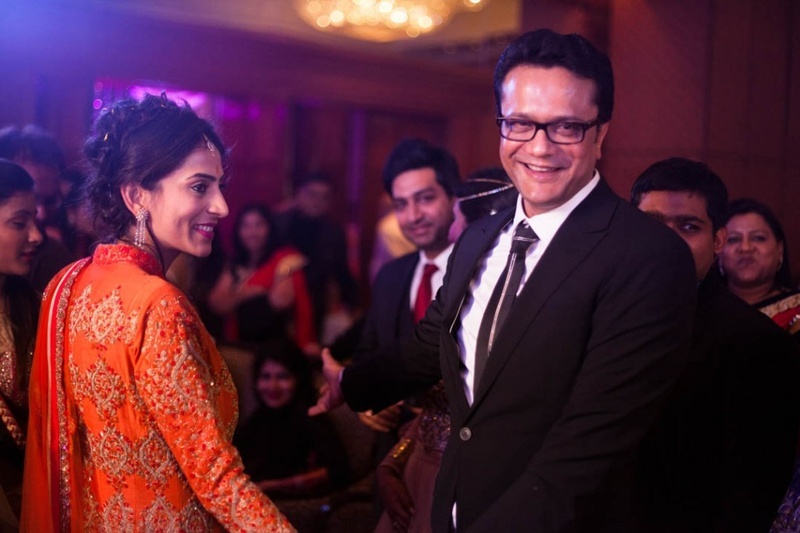 The fun and quirky Mehendi Ceremony held at Hyatt Regency, Kathmandu. 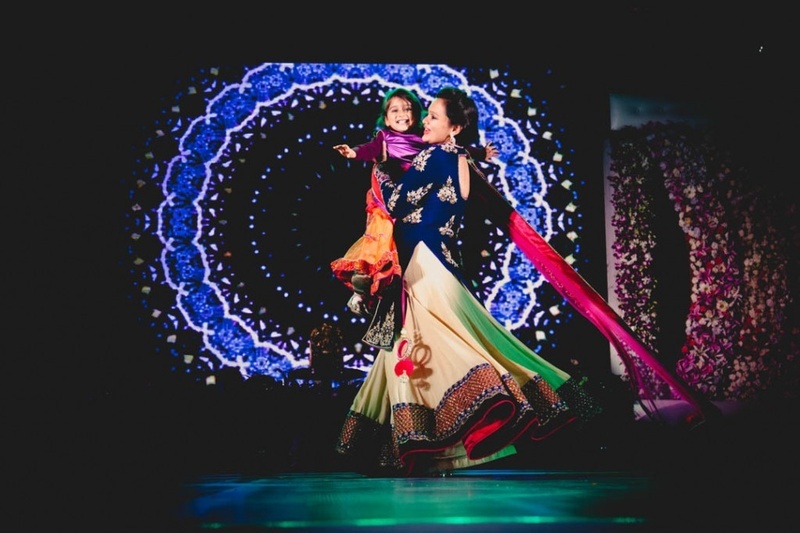 Mridula hugging her dad in between the sangeet ceremony. 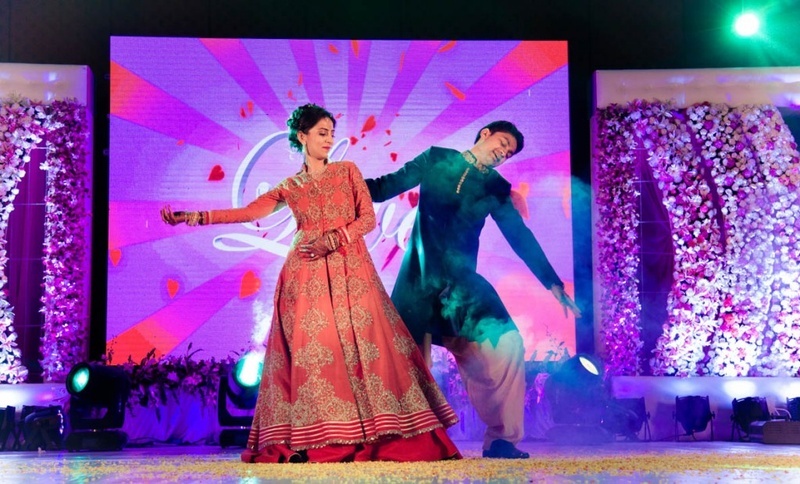 Mridula and Akhil's dance performance during the Sangeet ceremony. 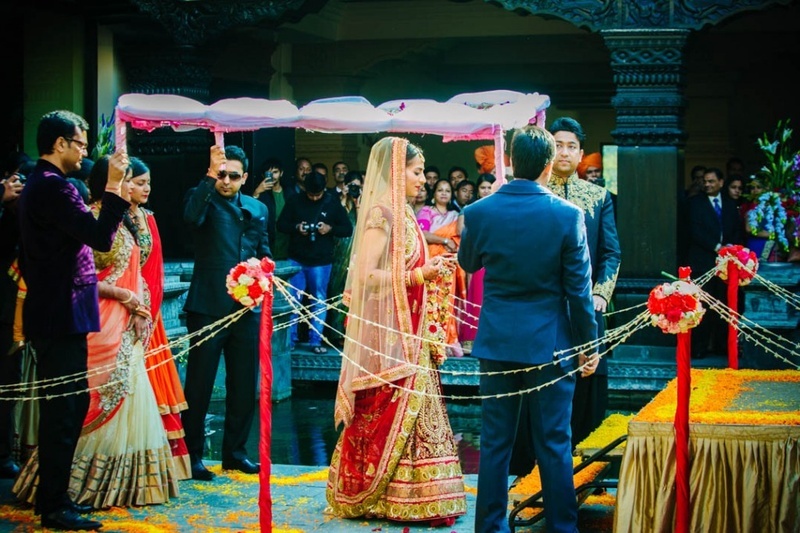 Outdoor sangeet set up with a beautiful backdrop held at Nepal. 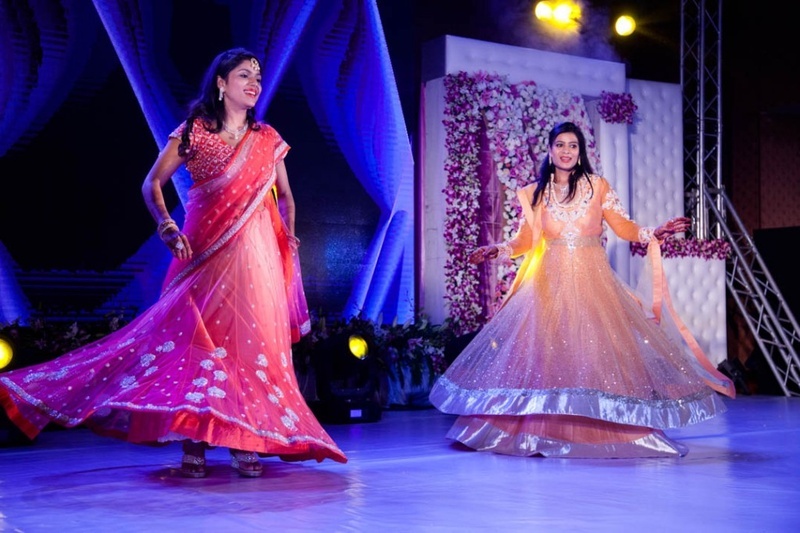 Led effects for evening sangeet with an amazing dance performance in a combination of navy blue and cream outfit. 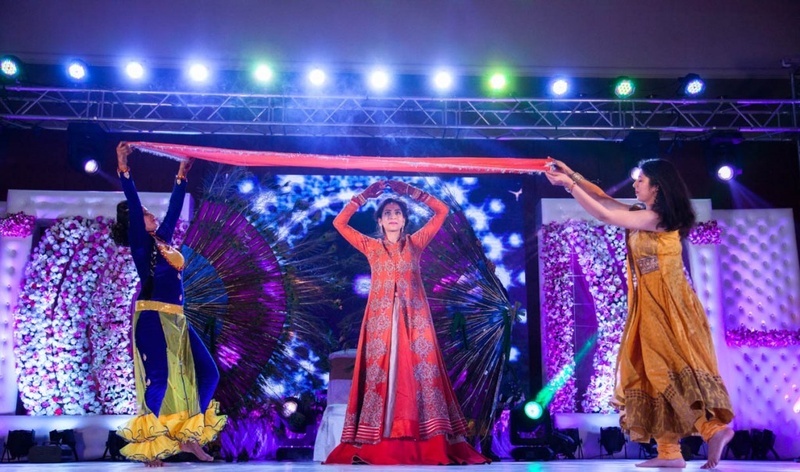 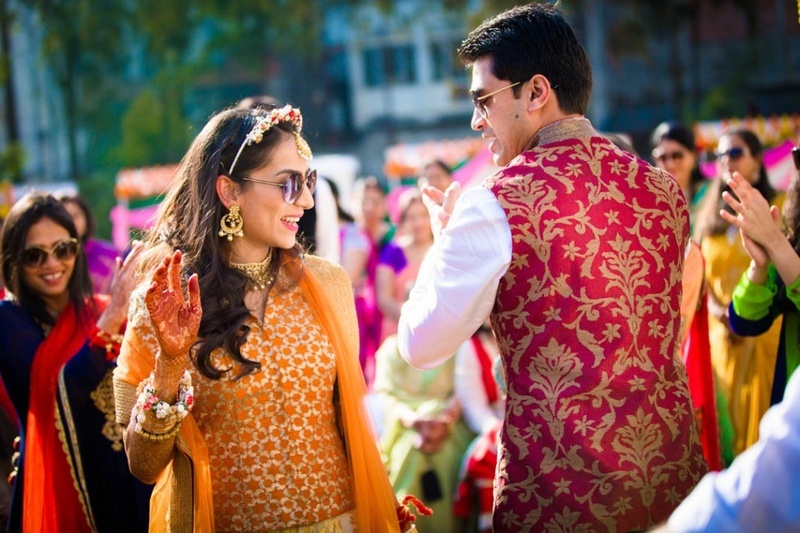 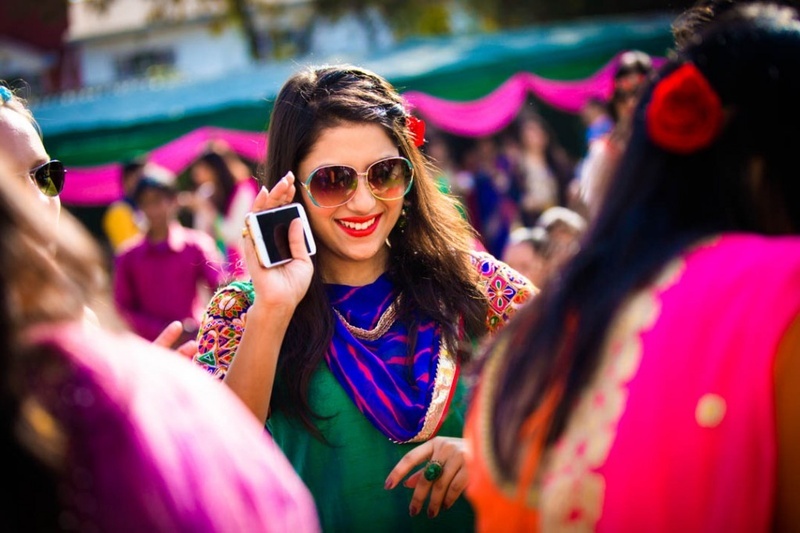 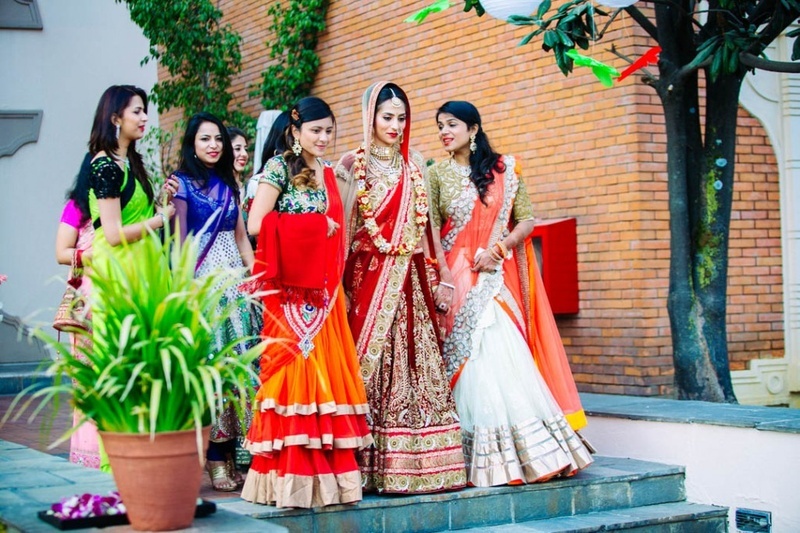 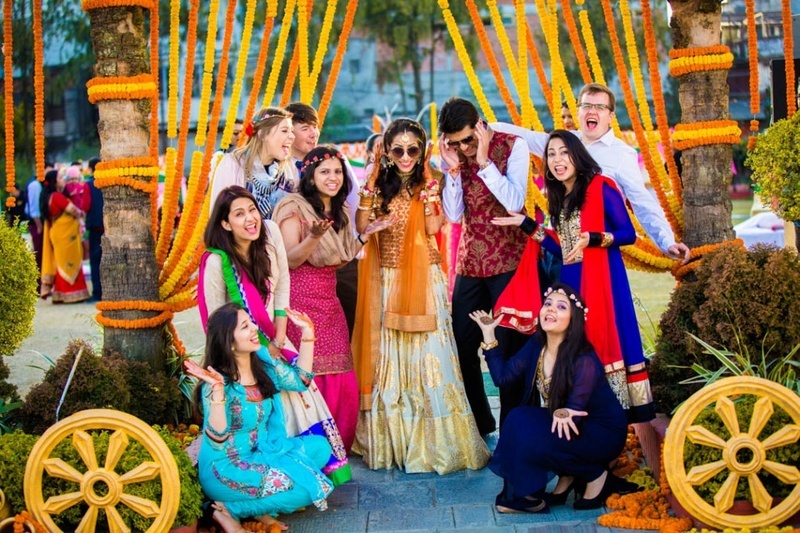 outdoor sangeet ceremony with a dance performance in colourful outfits. 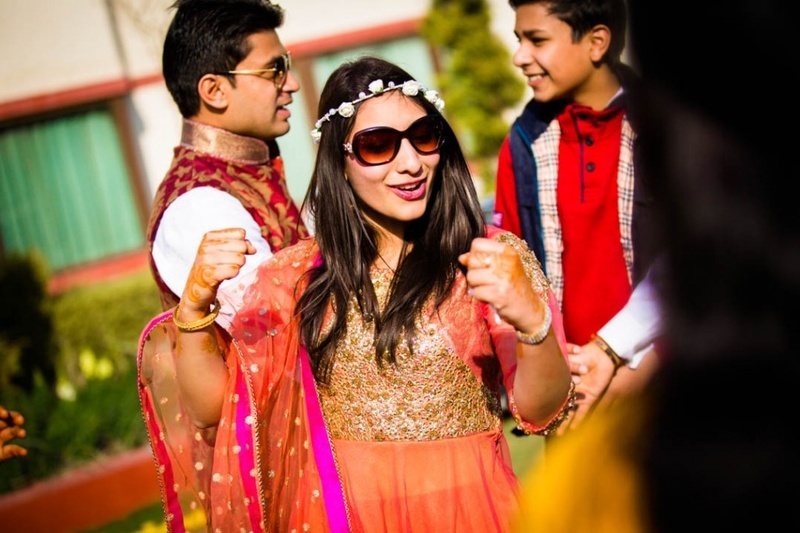 Mridula in peachy orange pink anarkali for the sangeet ceremony. 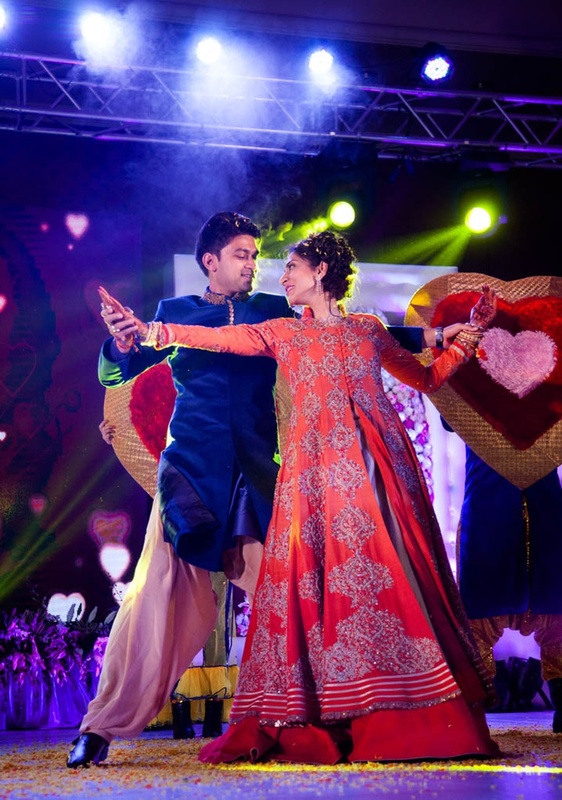 Couple's dance performance for their sangeet ceremony. 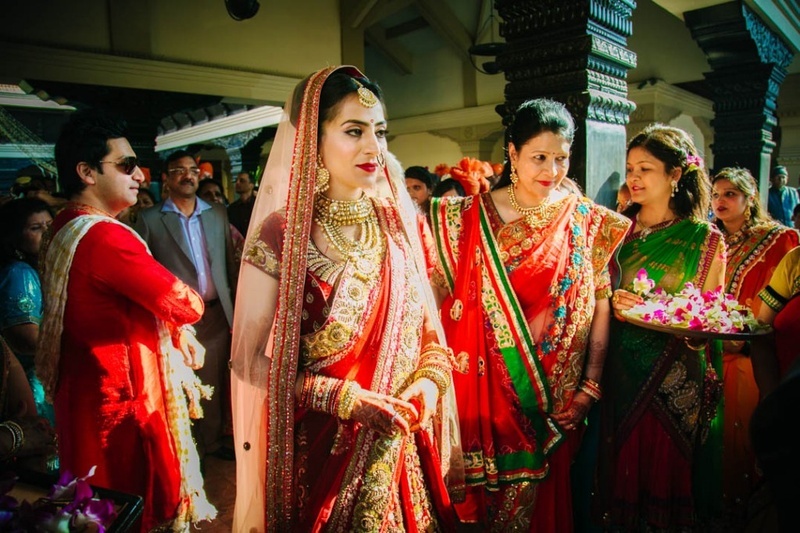 Mridula wearing red lehenga with heavy gold embroidery and zari work and heavy gold polki jewellery for the wedding ceremony. 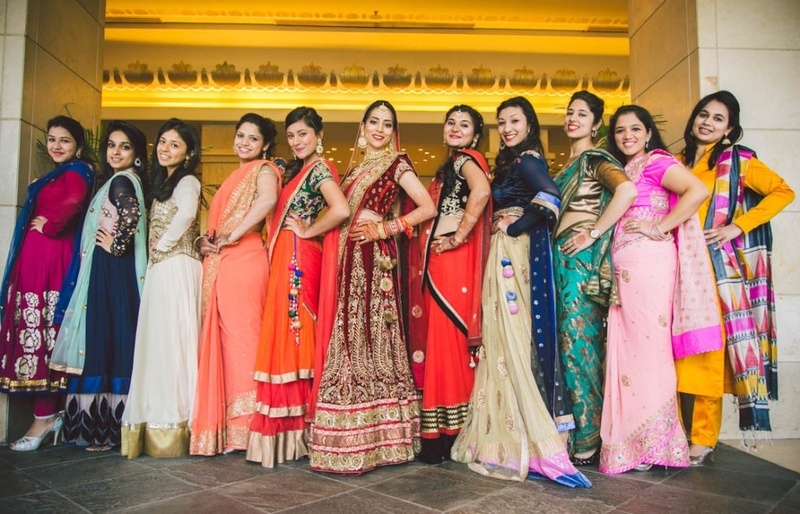 Bride and Bridesmaids posing just before the wedding ceremony starts. 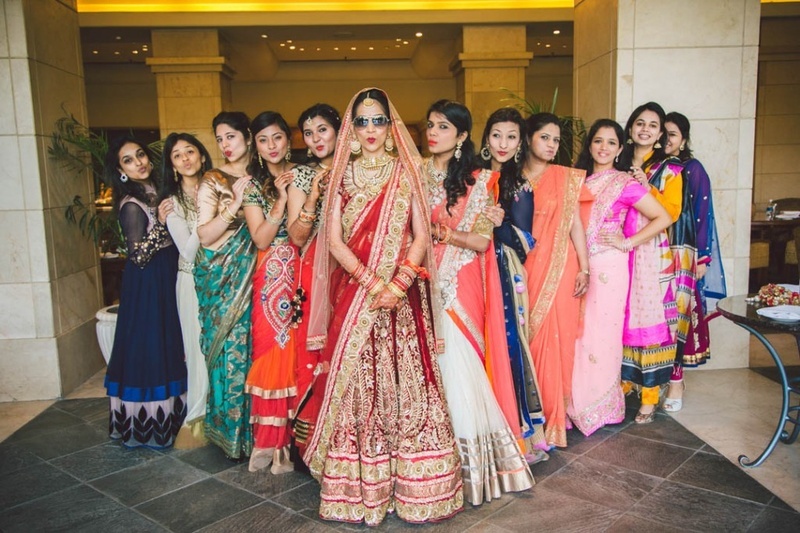 All girl gang posing for the photoshoot just before the wedding ceremony. 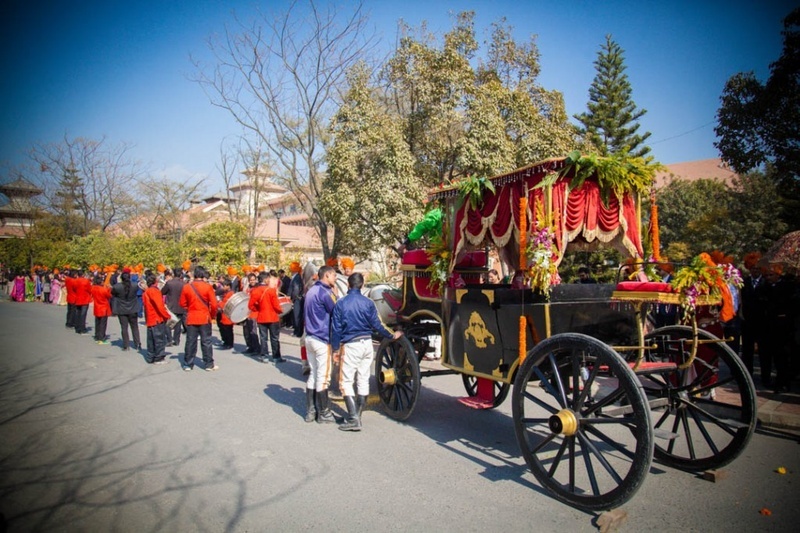 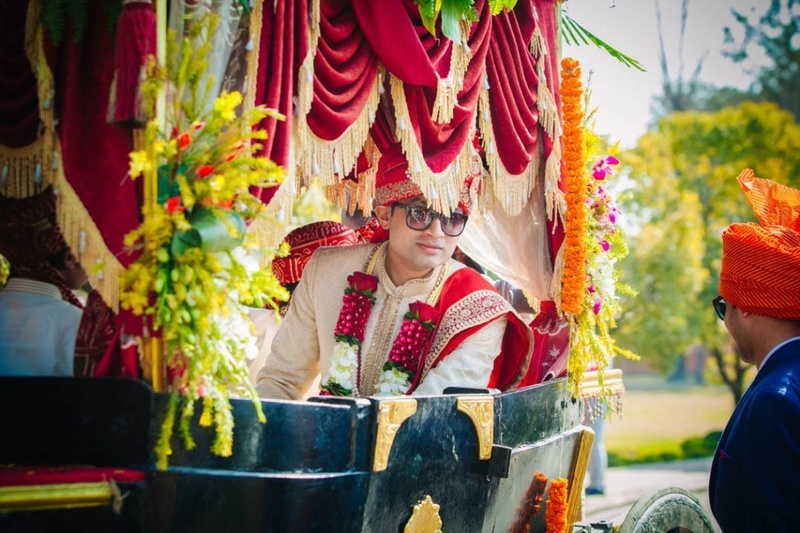 Groom entering the wedding ceremony in a beautifully decorated carriage. 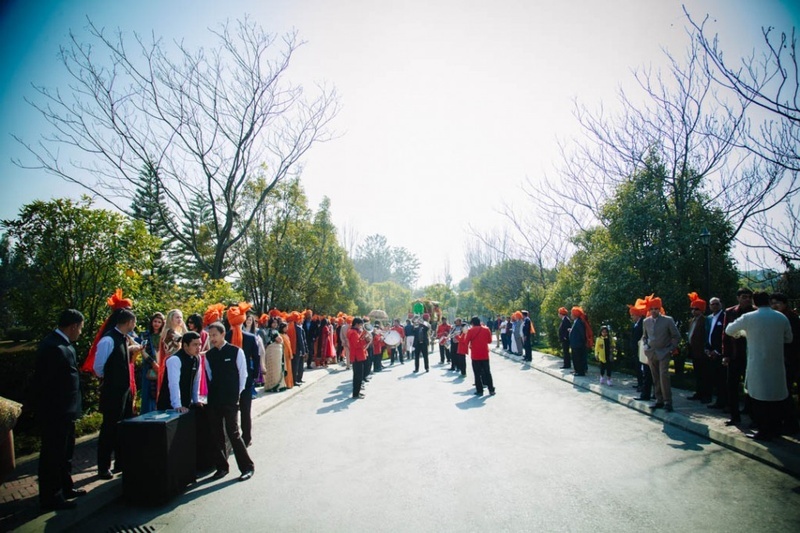 Walking towards the varmala ceremony. 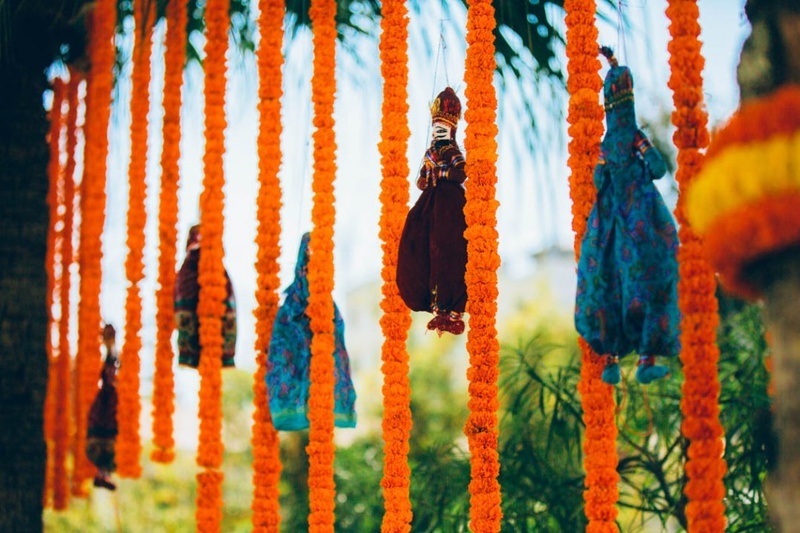 Holding the beautiful colorful flower garland for the varmala ceremony. 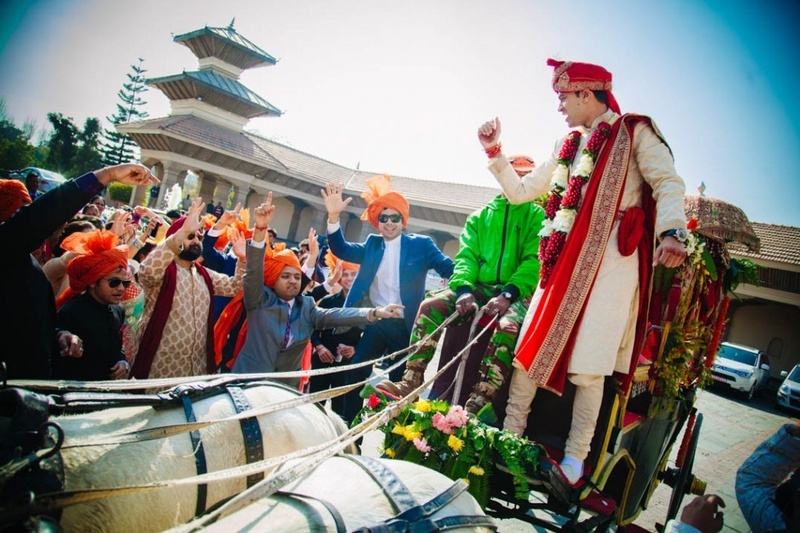 Jaimala ceremony held at Hyatt Regency, Kathmandu. 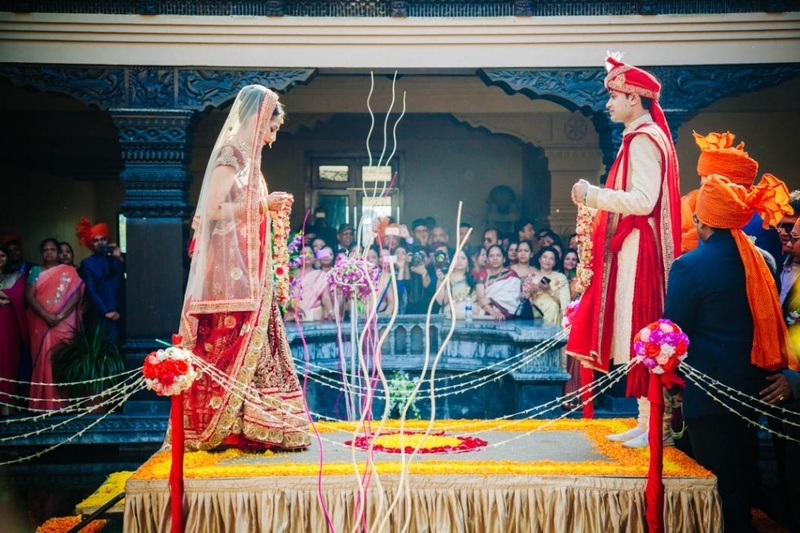 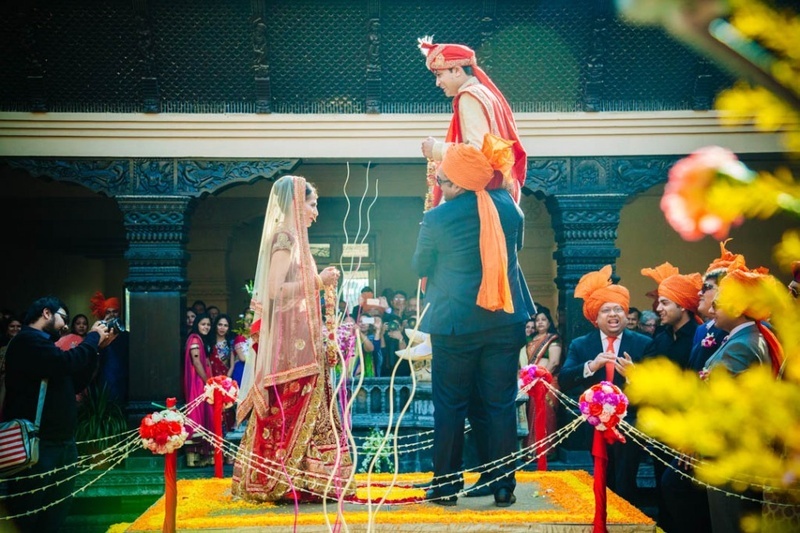 Color coordinated bride and groom wearing beautiful colorful flower garlands. 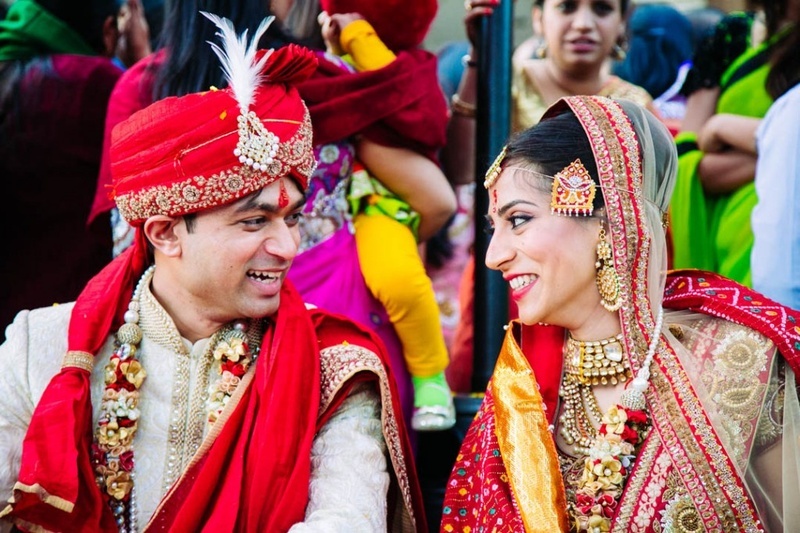 Candid couple photography by ace photographer Candid Shutters. 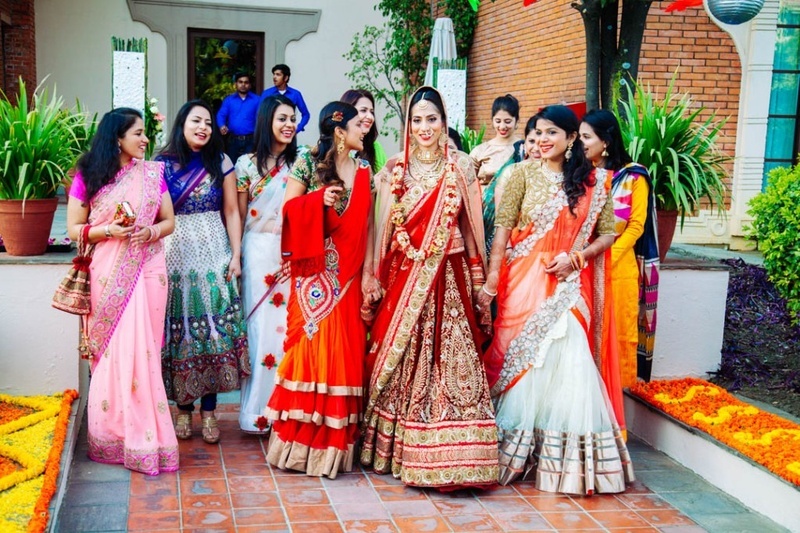 Bridesmaids walking the bride out of the wedding ceremony venue for the vidaai ceremony. 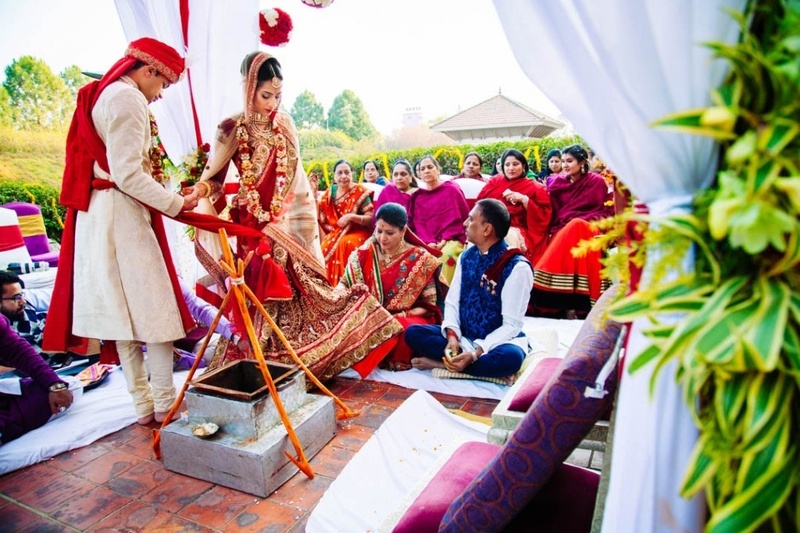 Vidaai ceremony post wedding. 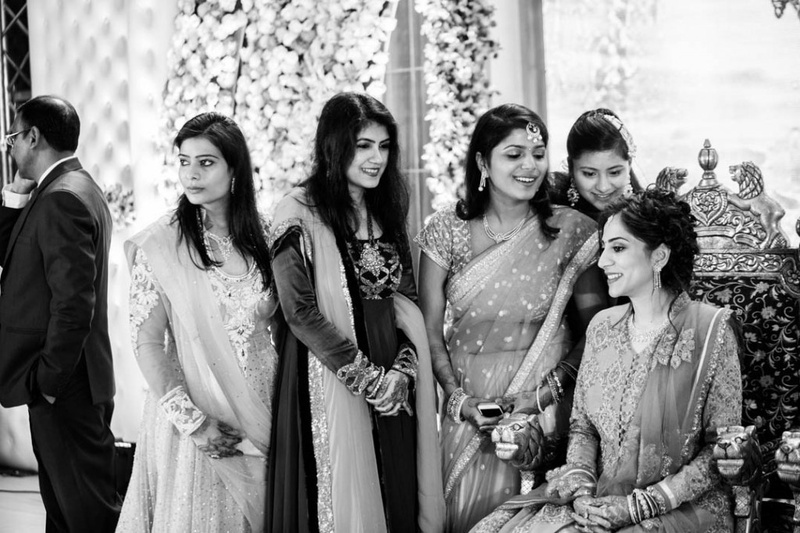 Emotional moment for the bride and her family. 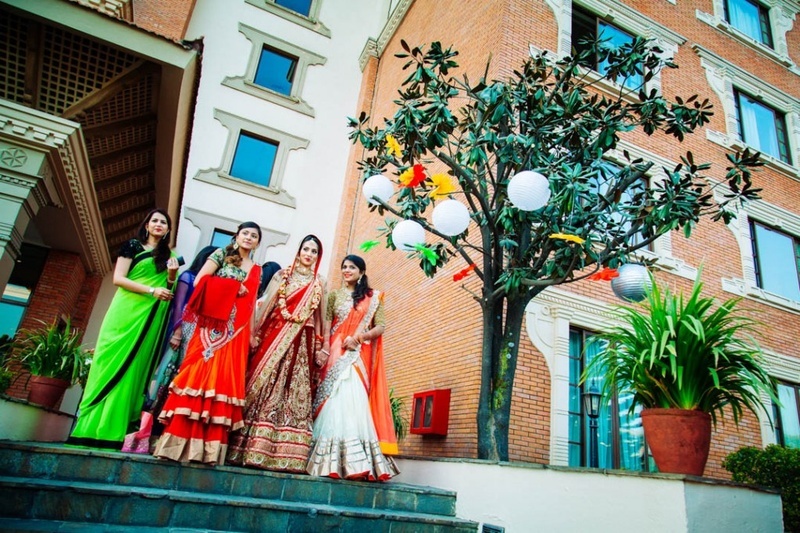 Post wedding couple shoot in Hyatt Regency, Kathmandu. 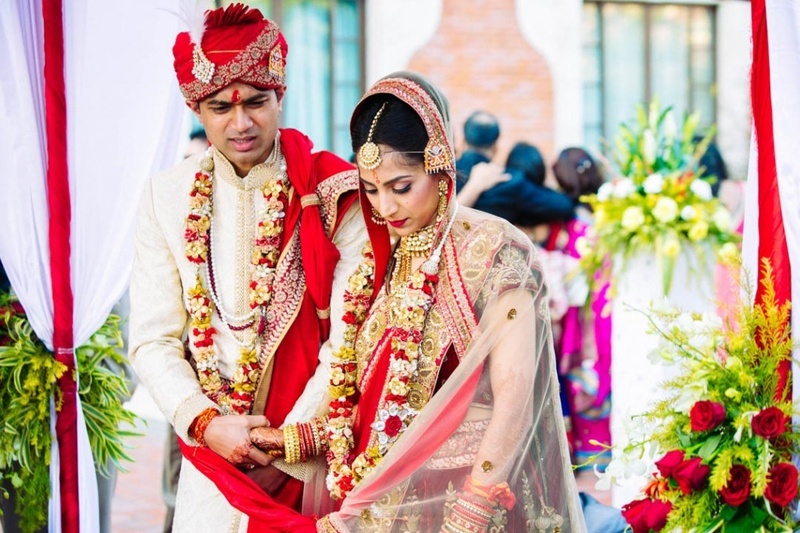 Bride and groom color coordinated well for the wedding day.